Want to have a Troll Inspired Treat? Want to know why you want a Troll Inspired Treat? Have you seen the Trolls yet? It is so freaking cute. And it is a great story too. Once about a time the Trolls lived every day feeling happy, singing and dancing. The the Bergens come and capture them. The Bergen had never felt happiness and learned that the only way for them to feel happiness was to eat a troll. So the Bergen came and capture all of the trolls and their tree and kept them in a cage. On the annual festival, the Trolls escape. The King of the Bergen was so mad, he banished the chef who has been in charge of preparing the Trolls to eat. 20 years later, the Troll’s princess, Poppy, wants to hold a celebration in honor of the day that the trolls escaped. Branch, a grumpy troll, warns that this is a bad idea because it could get the attention of the Bergens. Poppy does it anyway, and what happens? The Bergen chef who had been banished 20 years ago, sees the fire works and captures some of the trolls. Poppy manages to get away, but soon learns that the other trolls who escaped are not wiling to help her go rescue their friends. She takes off on her own but soon finds her danger. Suddenly, Branch is there to help her and together they make their way to the Bergens to rescue their friends. To find out what happens next, you will have to see the movie for yourself. Now on to the goodies. A Troll inspired smoothie pop. Based on Guy Diamond Glitter, these pops are so yummy you’ll want to be a naked troll too. Ok, maybe that is going a little too far. But they are that good. 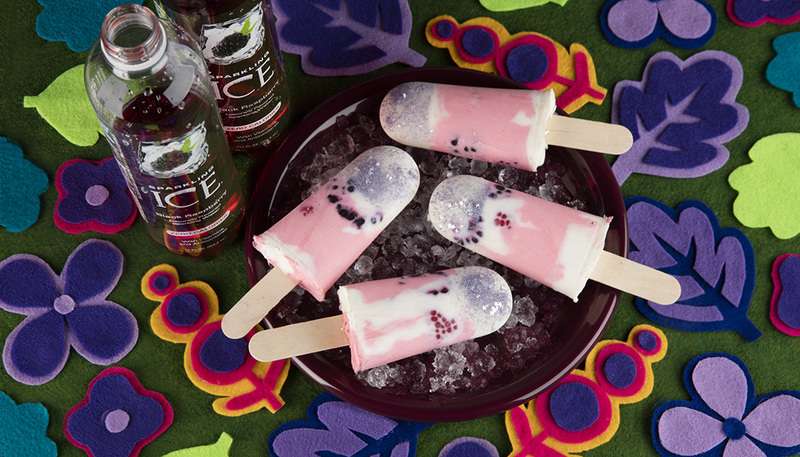 In a small bowl, combine 1/2 cup yogurt with Sparkling Ice Black Raspberry; mix well and set aside. Add a layer of vanilla yogurt to the bottom of each popsicle mold. 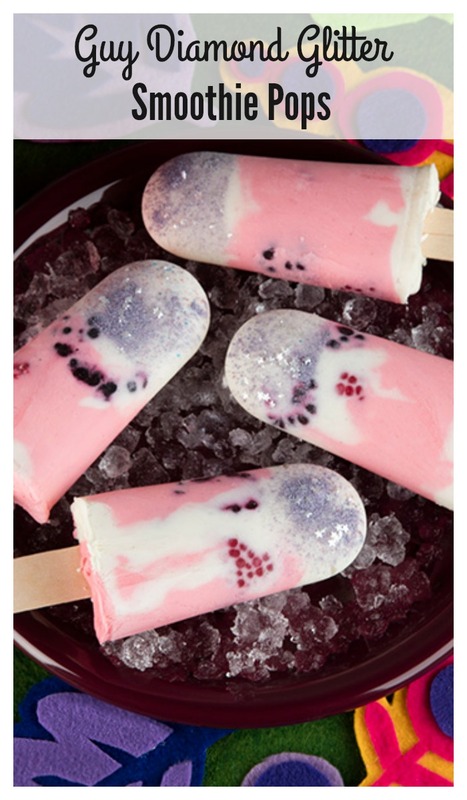 Add a layer of yogurt/Sparkling Ice Black Raspberry mixture and add 3-4 pieces of fruit to the mold. Finish each by dividing the remaining yogurt among the popsicle molds; use a knife or wooden skewer to swirl the mixture slightly. Insert popsicle sticks and freeze for at least 8 hours, or until completely frozen. Before serving, run popsicle molds under warm water to release the popsicles. Allow popsicles to sit at room temperature for 2 minutes and immediately sprinkle or brush with edible glitter or sparkling sugar. Serve immediately or return to freezer until ready to serve. Photo and Recipe courtesy of Ice.